I used to think that the 4 letters in the Myers Briggs Type Indicator were 4 scales and people fell to one side or the other, and some fell more to one side than others who fell toward the same side. In other words, each letter was like a slider and every person fell somewhere along the line. The problem with this model is that when I would compare two people who seemed to be very similar, like an ISTJ and an ISTP, they didn't really seem all that similar. One would cower at the sight of a spider while the other was booking reservations to go fling themselves from a plane with only a thin layer of silk protecting them from imminent death. I had heard people talk about functions before, but I couldn't really follow what they were talking about. It wasn't until I watched several of DaveSuperPowers videos on YouTube that it all finally started to click. An introverted sensor is a very different animal than an extraverted sensor. The introverted sensor likes to collect details, data, facts. They store them up in their brain and, if you give them reason to get started, will talk your ears right off of your head about all those little boring bits of details until you're ready to shove a pillow over your own face till the pain stops. The extraverted sensor, on the other hand, likes to collect experiences. The old Mountain Dew commercials ("Been there. Done that.") epitomized the idea of collecting sensory experiences. The more I learned about functions the more I came to realize that the 4 letters that describe a person's type are really not a series of scales, but a formula that describes the person's primary, secondary (and so on) functions. So an ISTJ and an ISTP are both S's, but they're two different kinds of S's: introverted sensor (Si) vs. extraverted sensor (Se). An ISTP (second function: Se) will have more in common with an ESTP (first function: Se) than an ISTJ (Se isn't among any of the ISTJ's functions). 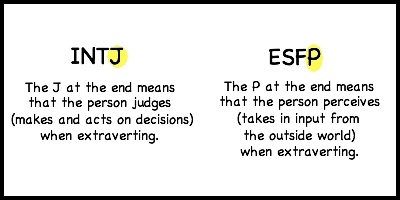 The INTJ (and any other person whose type ends with a J) will tend to be action oriented when they are extraverting. They will either be an extraverted thinker (Te) or an extraverted feeler (Fe). Te's are the people you call when something needs to get done yesterday. They are very practical, can-do people who will probably get to work even before you've finished telling them what needs to be done. An Fe is similar, except that they're not going to focus on things but on people. When people think "extravert" what they're often really thinking about is an extraverted feeler - someone who is people oriented. The ESFP, on the other hand, (and any other person whose type ends with a P) will tend to be input oriented when they are extraverting. They will either be an extraverted sensor (Se) or an extraverted intuitive (Ne). I mentioned Se's earlier. They're the "been there, done that" people who live in the now and seek sensory input. Ne's also seek input, but it tends to revolve around ideas. They love to brainstorm ways that things can be done differently or be improved upon. Once you have figured out how a person tends to behave when they are extraverting, you know one of their top functions. When they extravert, they are either Te, Fe, Se or Ne. But just as everyone has times when they are extraverting, we all also have times when we are introverting. We're not looking out or dealing with the outside world, but we're inside our own head, thoughts, feelings, or ideas. If our first function is extraverted, then our second function will be introverted. But if our first function is introverted, then our second function will be extraverted. Everyone has one extraverted function and one introverted function for their top two functions. Functions are something that we come to develop over time. When we're young, our primary function is the one that works the best for us, so we spend most of our time in that. But as we grow up we find that we have to learn to deal with the outside world (if we're introverts) or deal with our inner life (if we're extraverts). So we start to learn more about being in our secondary function. It's often not until we're adults that we begin to explore our third or fourth functions. If you've ever met a person who is in their 30s or 40s and they've said, "I used to be such and such a type, but now I'm more of this totally other type," that's because they're learning to use functions that they hadn't developed before. It doesn't mean that their personality has changed. Rather, they've reached a point in their life where they feel comfortable, perhaps even bored by, their primary and secondary functions and they're ready to stretch their wings a little into their third and fourth functions. To find the third and fourth functions, you simply do some flip flopping. 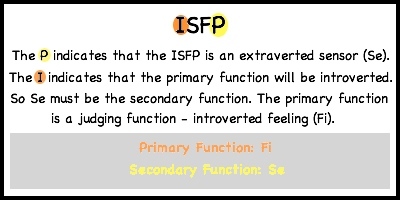 So if the second function was extraverted sensing (as in the ISFP example above), then the third function will also be a perceiving function (S/E), but it will be in the opposite attitude (I/E). 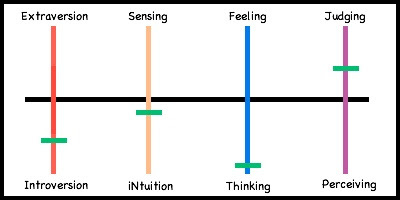 So the other perceiving function in this case is intuition, and the opposite attitude is introvertion. So the ISFP's third function is introverted intuitive (Ni). Likewise, the fourth function is just the flip flop of the first function. So in this case the first function is Fi, the fourth function will be Te. When using the scale method of MBTi, it's nearly impossible to figure out where you are, or where others are, on the scale. One day a person might be very secluded and thoughtful. The next day they might be the life of the party. As our circumstances vary, so do our behaviors. But there's a consistent pattern in there, and if you're start to look at the patterns, you'll see the functions emerge.